Udaipur is known not only as the city of lakes but also as Kashmir of Rajasthan or the “Venice of the East”. The list of beautiful lakes, lavish palaces and gorgeous temples showcasing architectural distinction make this a very popular tourist destination. Founded in the year 1553 by Maharana Udai Singh, this city has stood witness to many important events in the history of India and bears testimony to their culture and retains the remnants of the heritage they left behind. Let’s look at some of the best places to visit in Udaipur. The City Palace stands on the east bank of Lake Pichola. It is not one palace but a series of palaces with courtyards, terraces, corridors and gardens built at different times since 1559. You will find a museum here with many articles, furniture and utensils belonging to the royal families. Jag Mandir sits on an island by Lake Pichola. The royal family of Rajasthan used this palace as a summer resort, or a location to arrange parties. The history of the palace is a mixture of Rajput and Mughal – it was used as a sanctum by the Mughal Prince Khurram before he was Shah Jahan. It is an excellent example of history. Built in the 18th century, the Bagore-ki-Haveli is a beautiful mansion by Lake Pichola in Udaipur. The palace is beautiful, with hundreds of rooms displaying examples of costumes and modern artworks. There are Mewar paintings, as well. Also known as the Sajjangarh Palace, the monsoon palace is a hilltop residence of the Mewar kings, with a panoramic view of the city’s lakes, palaces and surroundings. This is now under the Forest department and open to visitors who are mesmerised by the their view of the sunset, from here. Formerly a palace and now a luxury hotel, the Lake Palace is a construction of incredible beauty, with fountains and gardens, columned courtyards and pillared terraces. It was first constructed by Maharana Jagat Singh in 1743. Visit, and be sure to look out for the arabesques studded with precious stones. Lake Pichola, named after the village nearby, is one of the oldest and largest lake in Udaipur. It is also one of the most beautiful, surrounded by verdant hills under a stretch of beautiful sky. More additions made to Maharana Udai Singh’s legacy are temples, bathing ghats, and lofty palaces. It is a sight to behold. The lake of Fateh Sagar in the north-west of Udaipur, is another beautiful spot the city can boast of. The hills that girdle this lake, with various species of plant life, contribute to Udaipur’s status as Rajasthan’s Kashmir. The lake has three small islands: one formed a public park, another the Nehru Park, and the last the Udaipur Solar Observatory. 12 kilometers away from Udaipur, around the Badi village, Lake Badi was constructed by Maharaja Raj Singh I. The lake was built to help ease the effects of famine during his reign. The lake has no bustling tourist-markets, temples or palaces. What lies there is a bare expanse of water, and it is this serenity that lends it charm. Once the largest example of an artificial lake in the world, the Dhebar Lake was built in the 17th century, after Rana Jai Singh constructed a marble dam across the Gomati River. The lake can be found in the Jaisamand Wildlife Sanctuary. 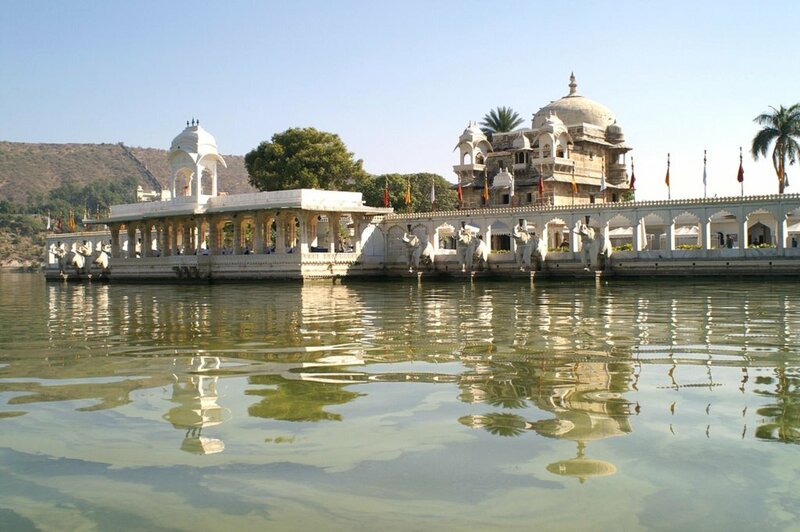 The Dhebar Lake has three islands, inhabited by the Bhil Minas of Rajasthan, and a visitor will find six cenotaphs, a Shiva Temple, a view of palaces across the waters. Located at the very center of Udaipur, by the Shiv Niwas Palace, Doodh Talai is small and exquisite. The attractions found around Doodh Talai are gardens, like the Manikya Lal Verma Garden, a wonderful view of the Pichola Lake, parks and ropeway that leads to the Karni Mata Temple. The Gangaur Ghat leads into the Pichola lake, where you will find the Bagore-ki-Haveli on the banks of the lake. A tourist attraction, especially for the Gangaur Festival – a great parade of palanquins and chariots, with folk-dances, where the idols of Gan and Gauri are immersed in the Pichola lake. Another festival celebrated by the ghat is Jal-Jhulni Ekadashi, both beautiful examples of Rajasthani culture. Ambrai Ghat, also known as Manjhi Ghat, is opposite the Gangauri Ghat and forms the seat of many hotels. The ghat is famous for the view it offers of the City Palace, and the many lakes that surround it. It is a sight to behold. The Ambrai Ghat has the famous Ambrai Restaurant at the banks of the Pichola Lake. The birthplace of the renowned King of Mewar, Maharana Pratap; the Kumbhalgarh Fort is a World Heritage site which was occupied until the 19th century. With a 38-kilometre-long wall, this is the largest walled complex in the world. Don’t miss the light and sound show. Moti Magri, meaning Pearl Hill, is a memorial to the Rajput King Maharana Pratap. Almost every Indian knows that he rode a horse called Chetak, and the bronze statue of the Maharana mounted on Chetak makes this place eminently worthy of a visit. A carnival encircling a three-tiered fountain, Sukhadia Circle in Udaipur offers a fast-food centers, horse-riding facilities, a view of a beautiful marble fountain, which is shaped to represent what looks like a wheat-ear, to conjure the image of prosperity. On the edges of Sukhadia Circle are a number of small gardens, and play-zones for children. At Ahar in Rajasthan, 2 kms from Udaipur, a collection of 250 cenotaphs exist that have been built over the course of 350 years. The cenotaphs are meant for the Maharajas of Mewar. A garden complex, Bada Bagh involves climbing a hill. Find a series of royal cenotaphs on climbing one of the several hills. The cenotaphs, marked by marble slabs and carved from sandstone, belong to royal family members, kings, queens and their children. Visit for a glimpse into the past. Rana Pratap is a part of the amazing history of Rajasthan and is considered an icon of the city’s historical heritage. The Pratap Gaurav Kendra is situated at Tiger Hill, which provides visitors with information on the history, using modern technology. The Udaipur Solar Observatory is located on an island on Fateh Sagar Lake. The sky above the lake is unusually perfect for solar observations, and is home to a number of telescopes. Come here for some educational fun, or if you have a science-enthusiast with you. Built on top of a tall terrace, this temple to Lord Vishnu is decorated with ornate carvings and boasts a 79 foot high steeple. Situated just outside the royal palace, this temple has been in continuous worship since 1651 and is a major tourist attraction. The Mewar Rana rulers believed that they ruled as the dewans of the ruling deity Eklingji. This 8th century temple complex was destroyed by invaders and was re-built in th 15th century by Rana Kumbha. Built in honour of a Hindu woman of a warrior caste, this beautiful temple with a marble facade is also known as the Temple of Rats. About 25000 rats live here and are worshipped and fed by people who consider eating food nibbled on by the rats here as a high honour. This beautiful garden with a lotus pond watched over by marble elephants is extremely scenic. The garden was built for the 48 maidens who were sent as attendants to a princess of Udaipur as a part of her dowry. Located in the centre of the city, Gulab Bagh is the largest garden in Udaipur. It houses a lot of government offices along with the Arya Samaj, a zoo, many ponds, a library and a toy train, all of which attract a number of visitors. Both Kumbhalgarh Fortress, and its Wildlife Sanctuary can be found in the Rajsamand District of Rajasthan. It covers Udaipur, Rajsamand and Pali, and part of its fauna are a number of species near-extinction. These include the Indian leopard, the golden jackal and the striped hyena. The jungle-guards bring out the peacocks of the region with handfuls of grain, and the visitors are allowed to watch. The Sajjanpur Biological Park is committed to the conservation of endangered species of wild animals. It offers visitors an excellent opportunity to see animals in their natural habitat. Spread over an area of 36 acres, the park can be visited at any time of the year. Recently built, this park is situated on the bank of Pichola Bank, a highly picturesque location. The park has an open gymnasium where citizens can work out, enjoy the greenery and say to themselves ‘ I love Udaipur’ even without looking at the human-sized lettering which proclaims the same sentiment to the world. Spacious and well- maintained, the Rajiv Gandhi Park situated right next to the Lake Fateh Sagar, where you can go boating. Especially favoured by children, this is a haunt of tourists and locals alike. This center was established with the aim of promoting the rural and tribal folk arts of Rajasthan. Visitors flock here to see folk arts like puppet shows, throwing light on the evolution of human imagination and storytelling techniques. Spread over an area of 70 acres, Shilpgram is a rural arts and crafts complex, set in the midst of the Aravali mountains. This initiative increases knowledge of such skills and ensures their continuation and propagation. The beauty about Udaipur is that it is not merely a traditional place stuck in the past. 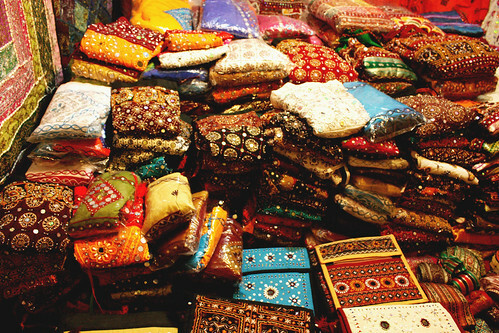 It is a vibrant city with a number of malls and wonderful handicrafts which have retained their old flavour without losing any of the allure.